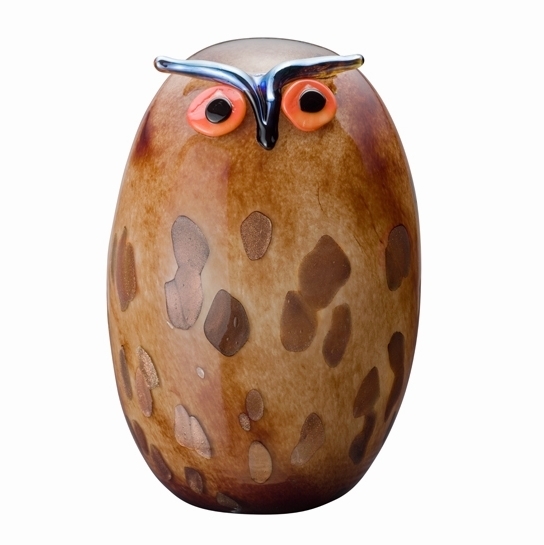 More about iittala Toikka Uhuu Owl Owls have long been a source of fascination to Oiva Toikka. While Toikka has made several beautiful owls in the past, Uhuu is by far the largest and most humorous. He is made of marbled brown glass, which is flecked with vibrant drops of reflective gold. His large round eyes are bright orange and have a watchful yet comic expression.The crowning jewel of this piece is the metallic blue beak and eyebrows. With its large round body and arresting eyes, this unique Toikka bird would be a great addition to any bird or owl collection.